This Teaching Workshop is designed for Yoga Teachers, Body Workers, Massage Therapists, Health Care Professionals and Experienced Students who are looking to safely experience and broaden their therapeutic methods into classes and private sessions. Somatic Yoga offers an effective method of reeducating the body and mind through gentle exercises reducing stress, anxiety and relieving chronic pain. Somatic yoga is suitable for all levels (beginner and advanced students). Soma means “the body experienced from within”. Somatic yoga provides a better sense of body awareness, calm and well-being. Somatic yoga physically increases flexibility, circulation, and range of motion and offers a simple and safe method to unlock tight and painful muscles while reeducating and helping restore healthy and supportive movements through the body and mind. Hanna Somatics was created from the work of Eleanor Criswell, Thomas Hanna and Moshe Feldenkrais. 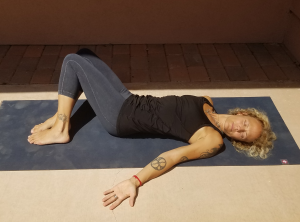 You will experience, demonstrate and teach a number of Hanna Somatic exercise movements that can be incorporated into yoga classes, therapeutic modalities and also may act as a stand-alone class. You will earn up 17 CEU’s with Yoga Alliance. This course also counts as a specialty workshop toward HereNowYoga’s 300 Advanced Yoga Teacher Training Program (www.herenowyoga.com/300-hour-herenowyoga-training).